In a shallow baking dish whisk together eggs, almond and coconut milks, vanilla and spices. Soak bread in batter, alternating sides until bread is soggy but not falling apart. Melt a teaspoon of coconut oil to a frying pan on medium heat. Add bread to pan allowing each side to get brown and crispy and the batter to cook through. For large batches place bread in a 150F oven to finish cooking and keep warm. 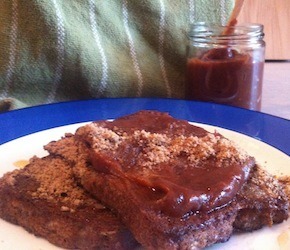 Top your French toast with ground flax, maple syrup, apple butter and/or a drizzle of coconut milk. Click here for for a delicious apple butter recipe!